Vincent van Gogh worked with the Impressionists in Paris. Even though many of his paintings appeared in the late 1800s though, he bridged the gap between Impressionism and Postimpressionism. He was actually not born in France, but rather in a Dutch village near the Belgian border. However, van Gogh travelled and painted in many cities including London, and settled in Paris. At one point, van Gogh went through a deeply religious phaze, but soon decided to give up organized religion entirely. During 1885, when van Gogh was living in Paris, he discovered the work of the Impressionists. He met some artists while there, including Degas, Pissarro, and Seurat. After this, van Gogh's paintings began to show light and warm colors, typical of the period. However, instead of soft brush strokes, he began to incorporate lines, dots, and dashes. 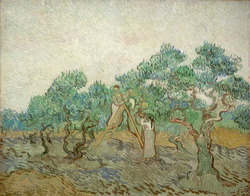 The Olive Orchard (1889) is a representation of this new direction of his work. He took an approach involving more free, curving, and twisting brush strokes. 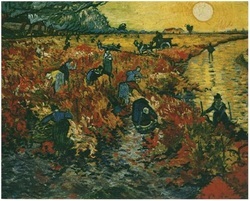 The Red Vineyard (1888) is a better example of the Impressionist style van Gogh used, with his own personal touch of harder lines between colors. In his paintings, there was less of the distinct brush strokes, but there was still great use of color with a more "messy" appearence. It was this change which introduced the Postimpressionism movement. One of van Gogh's most well-known paintings is Starry Night (1889), however this doesn't much demonstrate the Impressionist style. This is one of the paintings which lead scholars to name van Gogh a Postimpressionist. Postimpressionism is used as the term for those artists who moved on from Impressionism, but rather than abandon the style, built from it to create a slightly different style. Van Gogh eventually became very depressed and shot himself in 1890. Some of his paintings, such as The Olive Orchard reflect the disorganized mental state of the artist.